“Cabbala—a medieval mystical religious ‘doctrine’ prevalent among the most fanatical followers of Judaism, as well as among adherents of Christianity and Islam. The basic thought of the doctrine is the symbolic interpretation of the Holy Scripture, whose every word and number acquires special mystical importance in the eyes of the Cabbalists.” —Note 106, LCW 38. Utopian socialist and author of Voyage en Icarie. “The chief party of the liberal-monarchist bourgeoisie in Russia. It was formed in October 1905 and included representatives of the bourgeoisie, landowning Zemstvo members, and bourgeois intelligentsia. Prominent leaders of the Cadets included P.N. Milyukov, S.A. Muromtsev, V.A. Maklakov, A.I. Shingaryov, P.B. Struve, and F.I. Rodichev. While calling themselves the party of ‘people’s freedom’, the Cadets in reality sought to make a bargain with the autocracy in order to preserve tsarism in the form of a constitutional monarchy. After the February revolution, as a result of a bargain with the S.R.-Menshevik leaders of the Petrograd Soviet, the Cadets had a leading place in the bourgeois Provisional Government and pursued an anti-popular, counter-revolutionary policy favorable to the American, British and French imperialists. After the October Socialist Revolution the Cadets became irreconcilable enemies of Soviet power and took an active part in all the counter-revolutionary actions and campaigns of the interventionists. After the rout of the interventionists and whiteguards, the Cadets fled abroad and continued their anti-Soviet activity.” —Note 8, Lenin, SW 3 (1967). [In revolutionary parties or countries:] Personnel who spend a large part of their time educating, organizing and leading others in political or economic work. “The cadres of our Party and state are ordinary workers and not overlords sitting on the backs of the people.” —Mao, quoted in Peking Review, #38, Sept. 17, 1971, p. 13. “We must let the people express themselves. Cadres must be supervised both from above and from below. The most important supervision is that which comes from the masses.” —Mao, “Draft Resolution of the Central Committee of the CCP on some problems in the current rural work” (May 20, 1963); quoted in John Bryan Starr, Continuing the Revolution: The Political Thought of Mao (1979), p. 199. “... In the past we have also handled some cadres in an incorrect way. No matter whether we were completely mistaken in our handling of these people, or only partially mistaken, they should all be cleared and rehabilitated according to the actual circumstances. But generally speaking, this incorrect treatment—having them demoted or transferred—tempers their revolutionary will and enables them to absorb much new knowledge from the masses. —Mao, “Talk at an Enlarged Central Work Conference”, Jan. 30, 1962, in Stuart Schram, ed., Chairman Mao Talks to the People: Talks and Letters: 1956-1971 (1974), p. 160-2. “On the question of cadres participating in labor. Cadres must take part in labor. At present, this question has not yet been satisfactorily resolved. Leading cadres should go and stay in selected primary units and should not solely listen to briefings and reports. Even ministers should go and stay in some primary units.” —Mao, “Interjection at a Briefing by Four Vice-Premiers” (May 1964), SW 9:87. 1. The major branch of mathematical analysis consisting of the differential and integral calculus. Also known, rather inappropriately, but for historical reasons, as the “infinitesimal calculus”. The differential calculus studies the properties of a given curve at a specific point on it (such as its slope or rate of change), while the integral calculus studies the overall properties of the given curve, such as the area beneath it (or in the case of three dimensional curves, the volume they enclose). 2. Other branches of mathematics, logic, or organized thought, which involve calculation, generally involving the use of special symbols or notation, such as the propositional calculus in symbolic logic. “The calculus had its origin in the logical difficulties encountered by the ancient Greek mathematicians in their attempt to express their intuitive ideas on the ratios or proportionalities of lines, which they vaguely recognized as continuous, in terms of numbers, which they regarded as discrete. It became involved almost immediately with the logically unsatisfactory (but intuitively attractive) concept of the infinitesimal. Greek rigor of thought, however, excluded the infinitely small from geometrical demonstrations and substituted the circumventive but cumbersome method of exhaustion. Problems of variation were not attacked quantitatively by Greek scientists. No method could be developed which would do for kinematics what the method of exhaustion had done for geometry—indicate an escape from the difficulties illustrated by the paradoxes of Zeno.” —Carl B. Boyer, The History of the Calculus and its Conceptual Development (NY: Dover, 1959 ), p. 4. “The application of this new type of analysis [a dialectical analysis of variability by Scholastic philosophers], together with the free use of the suggestive infinitesimal and the more extensive application of numerical concepts, led within a short time to the algorithms of Newton and Leibniz, which constitute the calculus. Even at this stage, however, there was no clear conception of the logical basis of the subject. The eighteenth century strove to find such a basis, and although it met with little success in this respect, it did in the effort largely free the calculus from intuitions of continuous motion and geometrical magnitude. Early in the following century the concept of the derivative was made fundamental, and with the rigorous definitions of number and of the continuum laid down in the latter half of the century, a sound foundation was completed. Some twenty-five hundred years of effort to explain a vague instinctive feeling for continuity culminated thus in precise concepts which are logically defined but which represent extrapolations beyond the world of sensory experience.” —Carl B. Boyer, ibid. “The fundamental definitions of the calculus, those of the derivative and the integral, are now so clearly stated in textbooks on the subject, and the operations involving them are so readily mastered, that it is easy to forget the difficulty with which these basic concepts have been developed. Frequently a clear and adequate understanding of the fundamental notions underlying a branch of knowledge has been achieved comparatively late in its development. This has never been more aptly demonstrated than in the rise of the calculus.” —Carl B. Boyer, ibid., p. 5. [Arabic: khalifah “successor”] The top leader (temporal and spiritual) of a Muslim community, though this precise title is often informal. Different Islamic communities and sects acknowledge different top leaders, most of whom today have other official titles. Differences about who should be considered the caliph, or top leader of Islam, go back to the period following the death of Mohammed. The Sunni branch of Islam, to which about 83% of Muslims today adhere, believe that Abu Bakr, the father-in-law of Mohammed, was the first caliph. However, the Shiite branch, the other main sect, believes that Ali, the son-in-law of Mohammed, was the first caliph. Issuing a “call for action” is part of providing leadership of the workers and masses in struggle. However, as Lenin suggests below, issuing a “call for action” when there is not already some basis for getting people to act—through prior discussions, ideological education, and organizational work—can be simply a useless form of posturing. Moreover, the most effective calls for action are from those who themselves are already in action. Calls for action are necessary, but must grow out of previous work among the masses. “As for calling the masses to action, that will come of itself as soon as energetic political agitation, live and striking exposures come into play. To catch some criminal red-handed and immediately to brand him publicly in all places is of itself far more effective than any number of ‘calls’; the effect very often is such as will make it impossible to tell exactly who it was that ‘called’ upon the masses and who suggested this or that plan of demonstration, etc. Calls for action, not in the general, but in the concrete, sense of the term can be made only at the place of action; only those who themselves go into action, and do so immediately, can sound such calls. Our business as Social-Democratic [communist] publicists is to deepen, expand, and intensify political exposures and political agitation.” —Lenin, What Is To Be Done? (Feb. 1902), LCW 5:414. An obsolete and long abandoned scientific theory of the nature of heat, popular during the 18th to mid-19th century, which (along with the new understanding that combustion consisted of the rapid combination of oxygen with other elements) replaced the phlogiston theory. The caloric theory itself was eventually replaced by the modern theory of thermodynamics. The caloric theory viewed heat as an indestructable fluid of zero density which surrounded particles of ordinary matter. While this theory, like the phlogiston theory, sounds extremely foolish today, it was worked out to a remarkable degree. The temperature of a body was thought to depend on the amount of “caloric” that it contained. Thermal expansion was explained by the self-repulsive character of large amounts of the highly elastic caloric fluid. Because caloric was indestructable and could move from one body to another, the conservation of heat in calorimetry experiments was assured by this theory. These and other ad hoc supports to the caloric theory made it difficult to overthrow until the much more sophisticated theory of thermodynamics was substantially elaborated and backed with massive evidence, especially by the physicist James Prescott Joule. “In 1822, [Joseph] Fourier published his mathematical theory of heat conduction in solids based on a differential equation that indicates that the rate of flow of heat through a unit area perpendicular to an x-axis is proportional to the temperature gradient (rate of change of temperature, dT/dx) in the x-direction. It is interesting that Fourier wrote and developed his theory in terms of ‘caloric theory,’ an incorrect theory that held that changes in temperature are due to the transfer of an invisible and weightless fluid called caloric. Nevertheless, Fourier’s Law of Heat Conduction is correct and in agreement with experiments, even if Fourier’s idea of the nature of heat was not. As discussed in the introduction of this book, a law can explain how the universe works, even if the researcher who discovered the law is not quite sure why it works.” —Clifford Pickover, Archimedes to Hawking (2008), p. 235. A form of fatalistic Christianity put forth by John Calvin (1509-64) and his followers, and still embraced by some Christians today. This absurd doctrine (though really no more absurd than any other of the great number of specific varieties of Christianity) is usually said to consist of five main points (summarized by the acronym ‘TULIP’ from the first letter of each): 1) Total depravity: that human beings are totally depraved and completely corrupted by “sin”; 2) Unconditional election: Since people can’t change on their own, God has merely chosen some of them to be “saved” (i.e., go to heaven) without regard to their behavior or character; 3) Limited atonement: Only God’s “chosen” can (with His help) atone for their sins; 4) Irresistible grace: You can’t thwart God’s effort to save you if that is what he has decided to do; and 5) Perseverance of the saints: The supposed “guarantee” that once God has saved you, you’ll remain saved no matter what. The main theme in all this is that God has already determined what is going to happen, and therefore human beings have no choice in the matter. This is a good example of the sorts of additional ridiculous conclusions that religious people always arrive at! French writer associated with existentialism, whose most famous book was L’Etranger [The Stranger, or The Outsider] (1942). Although active in the French resistance during the Nazi occupation, a member for a while of the revisionist Communist Party of France, and co-editor with Sartre of a “left”-wing newspaper for a few years after World War II, he was never a genuine Marxist revolutionary. In 1948 he broke with “left” political writing, and focused more exclusively on promoting his decadent philosophy that “absurd humanity exists in an absurd world”. He received considerable applause from the bourgeoisie for his anti-Communist writing, such as his book L’Homme Révolté [The Rebel] (1951). He also supported French imperialism in its efforts to maintain control of Algeria (where he as born) and other colonies. Nevertheless, Camus remains a favorite author in bourgeois academia. He received the Nobel Prize for literature in 1957. The proportion of a company’s, an industry’s, or the entire economy’s productive capacity that is actually being used at the given time. If 20% of the factories, mines, etc., in a country are completely closed down, while the other 80% are being used at full capacity, that would be an overall 80% capacity utilization rate. If all factories and mines are running, but with short hours or minus one or more work shifts, so that they collectively produce only 80% of what they really could, that is also an 80% capacity utilization rate. A high capacity utilization rate encourages the capitalists to build more factories and is characteristic of a strong economy, whereas a low capacity utilization rate makes the capitalists reluctant to expand production, leads them to focus more on cutting costs to boost sales, etc., and is a sign of a weak economy (or one in recession). Obviously the capacity utilization rate depends on standards for what full capacity is understood to mean. Since the fundamental contradiction of capitalist production leads to the continual construction of new capacity that is not really needed, if the standards for what is considered to be operating at “full capacity” remained the same, the capacity utilization rate would drastically fall over time (though there would be smaller ups and downs within that overall trend). To hide this (and fool everyone, including themselves), from time to time the capitalists and their government lower the standards. Thus if at one time the definition for full capacity meant that factories operated around the clock with three shifts, but because of the increase in the number of factories, the usual situation is for most factories to have just one or two shifts, the standard for “full capacity” for the economy as a whole might be adjusted to say 1.5 shifts on average. In that case what the government counts as an 80% utilization rate might actually be only a 40% utilization rate on the older definition! 1. [Formal bourgeois economics term:] Assets minus liabilities; the market value of what a firm owns minus what it owes. 2. [Marxist term:] In modern bourgeois society most people think of capital as the same thing as money, and this is the way the bourgeoisie itself often informally uses the term. (“The company has enough capital on hand to build a new factory...”) But for Marxists this completely misses the central concept of what capital actually is. According to Marx capital is the wealth (including not only money, but—more essentially—also land, buildings, machinery and hired labor) that is devoted to the production of more wealth. The capitalist hires workers, who make practical use of that existing capital (factories, machines, raw materials, etc.) to create additional value (surplus value) which then automatically belongs to the capitalist. This retained surplus value becomes part of the expanded capital that the capitalist then owns. If an ordinary person, a worker, has some money saved up, or still available at the end of the month, that is not “capital”! (At least in the Marxist sense.) The reason is that the worker has no way of making use of that money to create more value, more capital. The worker does not own a factory, machinery, the necessary raw materials, etc., that would allow him to do that. On the other hand, even if a capitalist is deeply in debt, and needs to borrow more money to keep functioning, if he already owns a factory, machinery, raw materials, and purchases labor power (i.e., hires workers) he already has a tremendous amount of capital, and is in a position to make use of it to generate additional capital. Money can be used as capital (e.g., to build factories, buy machinery and raw materials, hire workers, etc.). Money which is actually used for such purposes is called money capital. But if money, whether a small amount or a large amount, is not used for such purposes, it is not capital. Thus to understand what capital actually is, it is first necessary to get rid of the simple-minded and grossly incorrect idea that “capital = money”. [A more precise, but more technical, definition:] Capital is self-expanding value, or a value which generates surplus value (and hence more capital) as the result of exploitation of wage labor. Capital expresses the socioeconomic relations of production between the two principal classes in capitalist society—the capitalists (or bourgeoisie) and the workers (proletariat). “Capital [is] the greatest work on political economy of our age.” —Lenin, “Frederick Engels” (1896), LCW 2:25. “Marx died before he could put the final touches to his vast work on capital. The draft, however, was already finished, and after the death of his friend, Engels undertook the onerous task of preparing and publishing the second and the third volumes of Capital. He published Volume II in 1885 and Volume III in 1894 (his death prevented the preparation of Volume IV). These two volumes entailed a vast amount of labor. Adler, the Austrian Social-Democrat, has rightly remarked that by publishing volumes II and III of Capital Engels erected a majestic monument to the genius who had been his friend, a monument on which, without intending it, he indelibly carved his own name. Indeed, these two volumes of Capital are the work of two men: Marx and Engels.” —Lenin, “Frederick Engels” (1896), LCW 2:25-26. Conversion of surplus value into capital. As capitalism develops there is a generally steady increase in the amount and rate of expansion of surplus value which goes into accumulation. Major interruptions occur in the process in the form of overproduction crises. “... capital is a certain relation between people, a relation which remains the same whether the categories under comparison are at a higher or a lower level of development. Bourgeois economists have never been able to understand this; they have always objected to such a definition of capital. “To regard the categories of the bourgeois regime as eternal and natural is most typical of bourgeois philosophers. That is why, for capital, too, they adopt such definitions as, for example, accumulated labor that serves for further production—that is, describe it as an eternal category of human society, thereby obscuring that specific, historically definite economic formation in which this ‘accumulated labor,’ organized by commodity economy, falls into the hands of those who do not work and serves for the exploitation of the labor of others. That is why, instead of an analysis and study of a definite system of production relations, they give us a series of banalities applicable to any system, mixed with the sentimental pap of petty-bourgeois morality.” —Lenin, “What the ‘Friends of the People’ Are” (1894), LCW 1:217. These are terms sometimes encountered in discussions of contemporary capitalism in China and other rising capitalist economies. Capital broadening means employing more capital (such as by building more factories) in order to hire more workers. Often these new workers are from the countryside and were formerly peasants. Capital deepening means adding more capital (such as by employing more sophisticated and expensive machinery) for the use of existing workers, and in order to increase their productivity. The total capital invested (in an economy, sector or individual company) divided by the total hours worked by the labor force over a standard period of time (usually annually) and generally expressed as a percentage. If this ratio rises it tends to indicate that the capitalists are spending an increasing proportion of their investments on machinery rather than hiring workers. According to the Bureau of Labor Statistics, in the period from 1990 to 2008 the overall capital-labor ratio for the U.S. (including outlays for factories and other buildings) increased by 29%. This is obviously just another way of talking about the rising productivity of labor, and the fact that over time fewer workers are needed to accomplish the same amount of work. The BLS reports that the capital-labor ratio in just the information processing sphere (computers) rose by a massive 310% from 1990 to 2010. This explains the rapidly falling need for clerical, computing and many other “white-collar” workers. This capital-labor ratio is a concept that is somewhat similar to (but not actually the same thing as) Marx’s concept of the organic composition of capital. A socio-economic formation based on the ownership of the means of production by the capitalist class (either in its traditional form of private ownership by individuals or corporations, or in the form of state capitalism where the capitalists own the means of production collectively as a class), and the exploitation of hired labor by the capitalists through the extraction of surplus value. “[T]he essence of capitalism is the appropriation by individuals of the product of social labor organized by commodity economy...” —Lenin, “What the ‘Friends of the People’ are” (1894), LCW 1:218. “Accumulation, or production on an expanded scale, which first appears as a means towards the constantly extended production of surplus-value, hence the enrichment of the capitalist, as the personal end of the latter, and is part of the general tendency of capitalist production, becomes in the course of its development, as was shown in the first volume, a necessity for each individual capitalist. The constant enlargement of his capital becomes a condition for its preservation.” —Marx, Capital, vol. 2, ch. 2, sect. 2; Penguin ed. p. 159. “The capitalist system is essentially an international system. If it cannot function internationally, it will break down.” —Henry Grady, an economist in the Roosevelt Administration during World War II. Quoted in Lloyd Gardner, et al., The Creation of the American Empire (1976), p. 508. The French phrase le capitalisme sauvage refers to American-style capitalism which is viewed as being more “savage” than that in Europe. Aspects of this American savagery include things such as the much inferior “safety net” for unemployed or injured workers in the U.S., the pathetically weak public health and welfare systems, etc., as well as the comparative recklessness and arrogance with which American capitalists speculate and operate, including internationally. It is certainly true that some capitalist socioeconomic varieties are more savage than others, with the Nazi fascist regime perhaps being the worst of all time. And yet, the French term falsely implies that capitalism is somehow civilized and acceptable in contemporary Europe, which is total nonsense. All forms of capitalism are horrible, even the “best” of them. A usually relatively short period, following a recession or depression, when capitalist economic activity (such as the growth of GDP, the construction of new factories and the hiring of a lot of new workers) expands rapidly. The bigger and more serious the previous economic crisis, the more potential there is for a powerful boom after it. However, because of the inherent internal contradictions of capitalism all such booms come to an end in the form of a new crisis of overproduction. The workers are not (and cannot possibly be) paid enough in their wages to buy all the products they produce. For a while the boom can be kept going by extending credit to the workers and others to buy what they could not otherwise afford, and by the construction of many new factories by the capitalists to produce the goods being sold on credit. Thus capitalist booms are really only possible because of ever-increasing debt and the ever-greater expansion of real productive capital itself. But, inevitably, there will be a financial crisis, and this overproduction of capital will be exposed. This will in turn lead to a contraction of real economic activity as well, in the form of mass layoffs, factory closings, and bankruptsies of capitalist enterprises: In other words, the boom will inevitably turn into its opposite, a serious new economic crisis. As time goes on, and with the further development of technology and more sophisticated methods of production, capitalist production becomes more and more powerful. Moreover, with the growth of giant monopolistic (or oligopolistic) corporations, companies become able to survive longer even when there are economic downturns. For reasons such as these it gets continually more difficult for capitalist economic crises to clear the ground for new booms. This in turn means that booms become ever weaker and shorter. There was one major exception to this in the mid-twentieth century, the Post-World War II Capitalist Boom, which was only possible because of the enormous destruction of real capital on a world scale during that horrendous war. But even this sort of “clearing the ground for a major new boom” through a major world war is probably no longer possible: A new world war today of that magnitude, and with modern weapons of mass destruction, would likely wipe out humanity entirely. For this reason, there will probably never be another major world capitalist economic boom on the scale of the one after World War II. One of several names used for the form capitalism has taken during the imperialist era (from the late 19th century on). Also known as “monopoly capitalism” or just plain IMPERIALISM. A term which originated in Maoist China for those individuals who sought to develop China’s economy through the use of capitalism or capitalist methods. One of the earliest usages of the term was on January 14, 1965, in the Central Committee document, “Some Current Problems Raised in the Socialist Education Movement in the Rural Areas” (known as the Twenty-three Points): “The crux of the current movement is to purge capitalist roaders in authority within the Party.” And in the much larger and longer Great Proletarian Cultural Revolution the capitalist roaders were also the primary target. Initially this term capitalist roader may sound sort of childish to Western ears, and bourgeois Sinologists have belittled it and even remarked that “the concept was an exceedingly primitive political artifice”. However, it is actually a quite sophisticated and important political concept. The term revisionist, for example, which means someone who tries to revise the revolutionary essence out of Marxism, is rather vague. In what way, precisely, is Marxism being illicitly revised? A capitalist roader is the specific type of revisionist who claims they are seeking to develop a socialist country after a proletarian seizure of power, but through the means of capitalism or at least via capitalist methods. Most capitalist roaders say that they “really do” want to bring about socialism and then communism, but that the way to do this is first through an extended period of capitalism. But as they institutionalize capitalist profits and promote the exploitation of labor and the build up of huge family fortunes of a tiny few, including by those in their own so-called “Communist Party” (which has many billionaire members now! ), that proclaimed goal of “someday” reaching communism through capitalism sounds ever more hollow and ridiculous. They inevitably change from capitalist roaders into outright capitalist exploiters who will never voluntarily agree to abandon capitalism. “The handful of capitalist roaders in power in our party are the representatives of the bourgeoisie in our party.” —Mao, Nov. 6, 1967; SW 9:421. “The rise of capitalist roaders is an extraordinary challenge to the traditional theory of the Party. As for defining who were the capitalist roaders, an analysis of the history of 30 years before and after Deng Xiaoping (this outstanding teacher by negative example) came to power in China can help us. The original definition for the capitalist roaders was ‘those in the Party with authority taking the capitalist road.’ However, a ‘capitalist road’ under a state of working class rule was not all that clear. It now appears that the capitalist roaders were those people in the Party with authority who applied capitalist logic in building socialism. “For example, on the question of which way forward for agriculture collective movement in the 1950’s, the three years of difficulties from 1959-1961 were clearly caused by the ‘communist wind’ and the ‘exaggeration wind’ pushed by Liu Shaoqi and Deng Xiaoping in 1958. But their proposed solution in 1962 was to decollectivize! In industry, for example, it was obvious that the problem with workers in some places who lacked enthusiasm for their work had to do with their leaders who were divorced from the masses and had their noses in the air. The solutions proposed by capitalist roaders, however, were to use material incentives and to impose strict workplace discipline to force workers to toe the line! “The long-time tendency of business and government to become more intricately and deeply involved with each other has [now] reached a new point of explicitness. The two cannot now be seen clearly as two distinct worlds.” —C. Wright Mills, The Power Elite (1956). 1. The issuance of securities (bonds, shares of stock, etc.) in return for investment capital. 2. The calculation of the current lump sum value of a future stream of regular income or cash flow based on the equivalent financial capital it would require to achieve that income at current interest rates. “Global emissions of the most prevalent greenhouse gas, carbon dioxide, rose to a new historic high last year, according to a U.N. report that warns the time for action to avoid disastrous climate change is running out. It adds that emissions began rising again during 2017 for the first time in four years. Levels of accumulated atmospheric CO2 reached a global average of 405.5 parts per million during 2017, almost 50 percent higher than before the Industrial Revolution. ‘The last time the Earth experienced a comparable concentration of CO2 was 3 to 5 million years ago,’ said World Meterological Organization Secretary-General Petteri Taalas.” —Steve Newman, “Earthweek: a diary of the planet”, San Francisco Chronicle, Dec. 2, 2018. Carbon monoxide is an odorless, colorless gas which is very poisonous. It is released by combustion of fossil fuels when inadequate oxygen is present, often by the burning of coal. 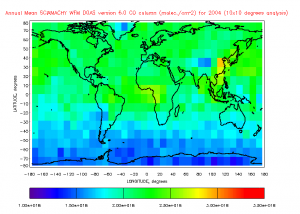 As the map at the right shows, the worst levels of carbon monoxide pollution in the world at the present time are in China, especially in the region from Beijing to Shanghai. Capitalists, especially in contemporary China, generally put profits ahead of the welfare of the people. Bourgeois empiricist philosopher of logical positivism associated with the Vienna Circle. Politically, he was a social-democrat, at least until he moved to the United States. Carnap had some utopian impulses, such as an enthusiasm for Esperanto. And he was a philosophical idealist in more than just his empiricism; he was also enthusiastic about parapsychology, for example. French physicist and engineer, one of the founders of the science of thermodynamics. He made many important basic discoveries concerning the nature of heat and energy, and its various transformations. The sphere of financial activity where a speculator borrows money in one financial market where interest rates are low, and then loans out the funds in another market where interest rates are higher. This is most commonly done across international borders, by borrowing money in a country where the interest rates are low (such as Japan in recent decades), exchanging the borrowed currency for a different one (such as U.S. dollars), which he can then lend out at a higher interest rate in a different country. While this may seem to be a fullproof way to “get rich”, there are a variety of risks involved, such as the possibility that the exchange rate between the two currencies will change in an unfavorable direction for the speculator thus wiping out his gains and even part of his initial investment. The word “Cartesian” refers to the French philosopher René Descartes (whose name in Latin is Cartesius), and to his followers. So “Cartesian materialism” refers to the partially materialist views of Descartes and his followers. Descartes was actually a dualist who thought that humans were made up of both a material component and a totally independent mental/spiritual component (which “somehow” connected up in the pineal gland in the brain!). However, he approached the description and explanation of the functioning of the human body (as well as those of other animals) in an entirely mechanical materialist way. This led to the general promotion of materialist conceptions in science and philosophy even though Descartes himself was not actually a true materialist. “Speculators may do no harm as bubbles on a steady stream of enterprise. But the position is serious when enterprise becomes the bubble on a whirlpool of speculation. When the capital development of a country becomes a by-product of the activities of a casino, the job is likely to be ill-done.” —John Maynard Keynes, The General Theory of Employment, Interest, and Money (Harcourt Brace: 1964 (1936)), Chapter 12, p. 159. The religious/feudal division of the population into hierachical groups (castes and sub-castes) with the higher castes having the most advantages and privileges, and the lower castes being oppressed and discriminated against in many ways. Traditionally, and to a large extent still today, people are restricted in the occupations they may engage in, who they can marry, and so forth, on the basis of the caste they are born into. Although this ancient caste structure has weakened somewhat as India and the other countries of South Asia become more modernized (i.e., especially in the cities), it is still a very serious problem in the region and strong evidence that feudalism and feudal ideas remain strong there. The caste system is associated with the Hindu religion especially. The highest and most privileged caste is the Brahmins, who dominate many professions. The lowest caste, now called the Dalits (formerly known as the “Untouchables” or “Scheduled Castes”) are the poorest and least educated. However, the Adivasis (or “tribals”) may be even worse off. Each year there are still many hundreds of “honor killings” in India in which families avenge inter-caste marriages and liaisons. It will almost certainly take a real social revolution in India to totally eliminate the reactionary caste system. The theory that the Earth, including its geology and the life upon it, has been shaped by sudden, short-lasting, leaps and disasters, often quite violent, and sometimes on a worldwide scale. This view is opposed by uniformitarianism or gradualism, in which the changes to the Earth itself and to plant and animal life, are more steady, slow and gradual. Modern science has pretty much come around to accept a combination of these two only-apparently totally opposed viewpoints, recognizing that many geological and biological processes are indeed quite slow and fairly steady (such as erosion and general long-term evolution), while at the same time now recognizing that there are also various sorts of relatively sudden leaps and drastic changes (including rare but disastrous massive meteor strikes and mass extinctions of biological organisms). Dialectical materialism, of course, generally stresses the importance of qualitative leaps in development. But at the same time it recognizes that there are often long periods of relative stasis between these great leaps, which however, when closely examined, also usually turn out to be a very long series of much smaller qualitative leaps. For example, when water is heated up in a tea kettle there are a vast number of tiny qualitative leaps as individual molecules of water suddenly acquire an energy jolt from the heated walls of the kettle or from other hotter water molecules. Only after this long process of what appears on the macro scale to be gradual change, does the water suddenly begin a much larger qualitative leap as it starts to boil. See: QUALITATIVE LEAPS. Most of the proponents of castastrophism were religious people, especially Christians, who took the Bible seriously as a history of the Earth and the life on it. Thus, because the chronology of the Bible suggests that the Earth was created around 4,004 B.C., any sort of recognition that the Earth actually has a very much longer history of development (currently estimated to be 4.6 billion years) was ruled out on religious grounds. Darwin took the opposite view, however, and had an appreciation of the great age of the Earth and the long history of life on it. Thus to begin with, catastrophism was the less scientific theory, and uniformitarianism was the more scientific point of view. However, the modern synthesis of the two viewpoints recognizes that there have indeed been many catastrophic events in the Earth’s history. And it is scientific investigation—not the Bible—that leads us to believe this. Although there have been many large floods in history, the Biblical story about the “Great Flood” in which only the animals that Noah saved on his ark survived is of course foolish nonsense. But there have been some other much greater catastrophes for the Earth and its denizens, which the Bible is totally ignorant of, including the meteor strike 65 million years ago which wiped out the dinosaurs and many other species. Moreover, over time, uniformitarianism has had to make numerous other sorts of concessions in both geophysics and biology to what is now sometimes called neocastastrophism. In evolutionary theory, for example, the traditional Darwinian attitude that evolution “must inevitably” be exclusively and uniformly slow and gradual has now been supplanted by the more sensible and dialectical view known as punctuated equilibrium which recognizes that speciation (the development of new species of plants and animals) can often be quite rapid in comparison with the relative stasis that species can then fall into, sometimes for many millions of years. 1. [In Marxist philosophy:] The most general notions or concepts reflecting the basic and essential properties and uniformities of the phenomena of nature, society and thought, such as matter, motion, time, space, consciousness, contradiction, necessity, chance, quality, quantity, capital, exploitation, etc. “Man is confronted with a web of natural phenomena. Instinctive man, the savage, does not distinguish himself from nature. Conscious man does distinguish, categories are stages of distinguishing, i.e., of cognizing the world, focal points in the web, which assist in cognizing and mastering it.” —Lenin, “Conspectus of Hegel’s Book Science of Logic” (1914), LCW 38:93. “Thus, it is not merely for idle fun that one calls a cat-like thing that one encounters ‘cat’, thereby assigning it to a preexisting category in one’s memory; it is principally because doing so gives one access to a great deal of extra information, such as the likely fact that it will show pleasure by purring, that it has a propensity to chase mice, that it may well scratch when threatened, tends to land on its feet, has a very autonomous character... These kinds of things, among others, can all be inferred about an entity once it has been assigned to the category cat, without any of them having been directly observed about the specific entity in question. Thus our categories keep us well informed at all times, allowing us to bypass the need for direct observation. If we didn’t constantly extrapolate our knowledge into new situations—if we refrained from making inferences—then we would be conceptually blind. We would be unable to think or act, doomed to permanent uncertainty and to eternal groping in the dark. In short, in order to perceive the world around us, we depend just as much on categorization through analogy as we do on our eyes or our ears.” —Douglas Hofstadter & Emmanuel Sander, Surfaces and Essences: Analogy as the Fuel and Fire of Thinking (2013), p. 21. “Each person’s repertoire of categories is the medium through which they filter and perceive their environment, as they attempt to pinpoint the most central aspects of situations that they come into contact with. And since our conceptual repertoires today are far richer than those of earlier eras, a random person today might well be able to astonish brilliant minds of previous ages by doing nothing more than making observations that to us seem routine and lacking in originality.” —Douglas Hofstadter & Emmanuel Sander, ibid., p. 130. To put into a category; to classify. This is done on the basis of analogies or disanalogies between the new item and the items in existing categories, or else the creation of a new category. “In short, nonstop categorization is every bit as indispensable to our survival in the world as is the nonstop beating of our hearts. Without the ceaseless pulsating heartbeat of our ‘categorization engine’, we would understand nothing around us, could not reason in any form whatever, could not communicate with anyone else, and would have no basis on which to take any action.” —Douglas Hofstadter & Emmanuel Sander, Surfaces and Essences: Analogy as the Fuel and Fire of Thinking (2013), p. 15. There are causes and effects in the world because the world is in motion, or because it is changing and developing. Many (all?) changes lead to other changes, though of greater or lesser significance, and the ones they lead to are called the effects, while the changes that lead to these effects are called the causes. The causes themselves were the effect of previous causes, and the effects themselves cause further effects. The world continues to change. For us Marxist revolutionaries, the goal is to scientifically determine which things in the world that we can change which will serve as causes to eventually bring about the social effects we desire—namely, the end of capitalism and its replacement by communism. See also: Philosophical doggerel on the topic. An abbreviation commonly used by revolutionaries in India to refer to the “Comprador Bureaucratic Bourgeoisie”, or in other words, the ruling class in India which is made up of a mixture of comprador capitalists and big bureaucrat capitalists.